With the release of Legendary Duelists: Sisters of the Rose, Savage Strike, and the Speed Duel Starter Decks: Duelists of Tomorrow & Destiny Masters jumpstarting the new year, 2019 is already off to a hot start! Display and protect these cards with accessories that showcase some of Dueling’s most iconic cards with the Golden Duelist Collection. The Golden Duelist Collection draws together dozens of fan-favorite Monsters, Spells and Traps in a rich black and gold motif punctuated by a timeless image of Yugi and the Dark Magician. Keep your Deck safe on the go with the Golden Duelist Collection Card Case, featuring an exclusive glittering foil unique to the Collection. Show off your trades with the Golden Duelist Collection Duelist Portfolio featuring the same foil finish, and hit the table with the Golden Duelist Collection Game Mat and Golden Duelist Card Sleeves to match. The stylish black and gold motif runs through all four accessories, lending a touch of luxury to your Dueling that even Kaiba would approve of. Card Sleeves MSRP: $3.99 each 50-count pack, Card Case MSRP: $4.99 each, Game Mat MSRP: $14.99 each, available February 15. Duelist Portfolio MSRP $9.99 each, available April 5. Also releasing February 15 is Structure Deck: Soulburner! Straight from the animated series to real life, Soulburner’s Salamangreat Deck from the Yu-Gi-Oh! VRAINS animated series offers monsters a new lease on life with its “reincarnation” strategy! Salamangreat powers up its boss monsters in a unique way. By sending your first copy of a “Salamangreat” boss monster to the Graveyard to Summon your second copy, the new one is granted an extra ability far beyond what it had in its first life! 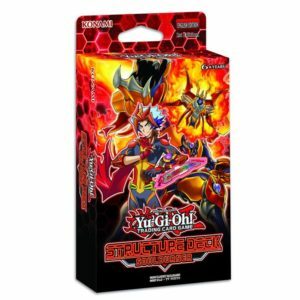 Each box of Structure Deck: Soulburner contains a Beginner’s Guide and a Double-sided Deluxe Game Mat/Dueling Guide, with a 40-card Main Deck and a 6-card Extra Deck for a total of 46 cards. MSRP: $9.99 per Box. March is jam-packed with releases to keep fans happy throughout the spring. March 8 sees the release of the Savage Strike Special Edition! Not only does it include 3 booster packs of Savage Strike, each box is guaranteed 1 of 2 Super Rare variant cards (either Trickstar Crimson Heart, a Link Monster to go with the many powerful “Trickstar” cards in Savage Strike, or White Rose Dragon, a new monster designed specifically to enhance Decks built with cards from January’s Legendary Duelists: Sisters of the Rose), as well as 1 of 2 Super Rare preview cards of non-foil cards from the upcoming Dark Neostorm booster set (either Yuki-Musume, the Ice Mayakashi, a monster that adds a jolt of extra Summoning power to the Mayakashi Deck from Hidden Summoners, or a new Cyberse monster). MSRP: $9.99 per box. Join the quest on March 22 to obtain overwhelming Dueling power with the all-foil booster set The Infinity Chasers! Duelists looking to pick up a new strategy should look no further, as The Infinity Chasers introduces 3 new strategies with their own unique gameplay styles. All the basic cards for each theme are in this set, along with some additional cards to help support them, so it’s a great starting point for building many different Deck strategies! 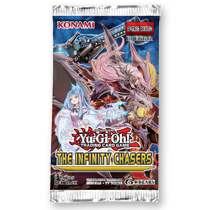 The Infinity Chasers booster set contains 40 Super Rares and 20 Secret Rares, for a total of 60 cards. MSRP: $3.99 per pack (5 cards per pack). Brand-new cards will be added to the Speed Duel card pool with the very first booster, Speed Duel: Arena of Lost Souls! Releasing March 29, Arena of Lost Souls sees the debut of Yugi’s renowned Royal Knights to the Speed Duel format, Ishizu with the power of Gravekeepers, and Bonz with a horde of Zombies! The Speed Duel: Arena of Lost Souls booster set is made up of 45 new-to-Speed Duel cards and 5 brand-new Skill Cards. MSRP: $1.49 per pack (4 cards per pack). On April 5, Duel Power celebrates spring by rolling together a new 100-card Ultra Rare booster set (including 40 brand-new cards) alongside new Ultra Rare variant artwork of every Yu-Gi-Oh! TV series ace monster (from Dark Magician to Decode Talker), and a new double-sided Gameboard celebrating Yu-Gi-Oh!’s history. Each box of Duel Power contains 6 new Duel Power booster packs with 5 Ultra Rare cards per pack. This set includes 40 new cards and 60 hot reprints, including the 4 popular “discard” effect monsters (from Ghost Ogre & Snow Rabbit to Ghost Belle & Haunted Mansion); popular Spells and Traps like Infinite Impermanence, Card of Demise, and Evenly Matched; Link Monsters from Borreload Dragon to Trickstar Holly Angel; and out-of-print cards like Naturia Beast, High Priestess of Prophecy, and 2015’s “Nekroz” Ritual Monsters. MSRP: $29.99 per set. On April 19, the magical masters of Structure Deck: Order of the Spellcasters have transcended the need for physical forms and gained the ability to become Spells themselves! As Pendulum Monsters, they can be played as either monsters or Spell Cards, and have different abilities depending on which you choose. This Structure Deck uses the same “Spell Counter” system as the Spellcaster’s Command Structure Deck and the “Mythical Beast” monsters from Extreme Force, so cards from all three can be combined to create an even more powerful Deck! Each Structure Deck: Order of the Spellcasters contains a 41-card Main Deck + 1 Extra Deck monster for a total of 42 cards, plus a Beginner’s Guide and Double-sided Deluxe Game Mat/Dueling Guide. MSRP: $9.99 per box. Forget about April showers, the real storm is brewing May 3, the official release date of Dark Neostorm, the last 100-card booster set of the 2018-2019 Dueling season! Each of the core booster sets this past season highlighted one of the main Special Summoning mechanics from previous eras of the game, and in Dark Neostorm, it’s Xyz Summoning’s turn to shine! The Dark Neostorm booster set contains 100 cards in all. MSRP: $3.99 per pack (9 cards per pack). Between conventions, qualifier tournaments and in-store events, Duelists will have plenty of opportunity to put their skills to the test this summer. 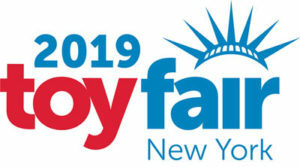 For more information on KONAMI’s extensive Organized Play programs, including opportunities for aspiring Duelists to learn how-to-play the game, go to www.yugioh-card.com/en/events.